A western trough is going to enter the west coast and push east, possibly becoming a major weather system. Thankfully this setup will not favor significant severe activity in the region that just got devastated. The pattern didn't scream tornado outbreak, but there definitely were signs. This is not the case here. A cold front is currently pushing southward and it'll eventually make it to Cuba. On the morning of the 7th, the front will stall out and begin to bring moisture north. Notice the southerly winds in the southern Plains. A system with Pacific origins will strike the Midwest while effectively not having a cold front to push the moisture south. This is very important. The trough seen off the coast of California in the above image is the trough that this thread will be focused on. By the time the trough crosses the Rockies, there's a decent amount of moisture... but out of context, not as much as one would expect from 2.5 days of southerly winds. There's a good deal of uncertainty in amount of moisture return (which is a function of the weak system preceding this) and the speed/strength of this low pressure. Therefore, there's some uncertainty in where the severe threat is, and where it's the greatest. As of right now, it appears to be in the Arkansas/Louisiana/Mississippi area. 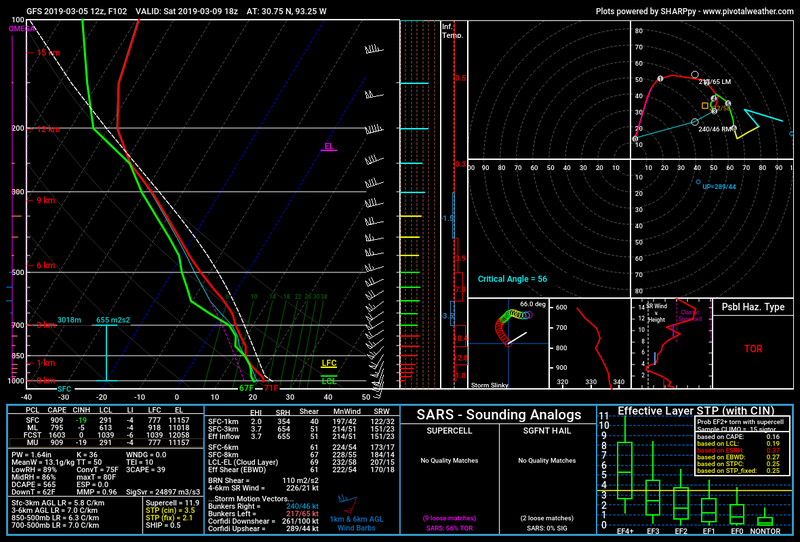 A GFS sounding from that area shows sufficient CAPE and very strong wind shear. Out of 15 analogs for this pattern, 5 were severe weather outbreaks in the aforementioned region. It's also showing a secondary area of severe weather further north near the low, which fits with what the GFS is showing. Euro has a significant severe threat for east Texas; 2000-2500 CAPE, 50 knots southwesterly winds at 850mb, 60 knots westerly winds at 500mb. Due to Euro being quite a bit further west than GFS, not expecting SPC to delineate any area yet. Great write up. I'm not sleeping on this one, woke up this morning and looked at the 0z GFS and instantly knew there might be something here. There's no thread, but did anyone see the 2-3" in Jacksonville, NC and surrounding regions? SPC went with an interesting approach. Thanks. Yeah, the entire pattern screams something's bound to happen but this would be a bigger event if we didn't have a cold front push to Cuba. For being the GFS, got some decent parameters. One thing that won't be lacking is shear because of how strong the system will be. Just need better moisture. 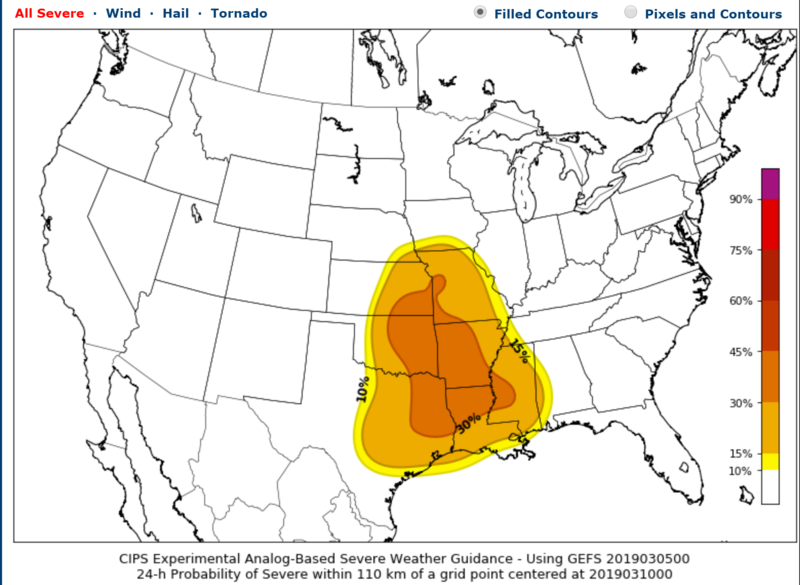 00z Experimental CIPS analog-based severe probabilities. I haven't seen 15% tornado yet on this, so that's interesting. Keep in mind that I don't think these analogs came after a big Arctic blast, so moisture was probably richer. 12z Euro continues with a more impressive severe threat especially for far east Texas, Arkansas, and at least the west half of Mississippi. Still looking like yet another big negative tilt. Those last CIPS analogs are new to me. Looks identical to the SPC delineation. Wonder if that's what SPC uses for their outlook graphics? I always wondered how they determined the specific shapes they use. Im sure it’s a part of guidance they use but it’s experimental. It’s new and made to be identical to SPC. 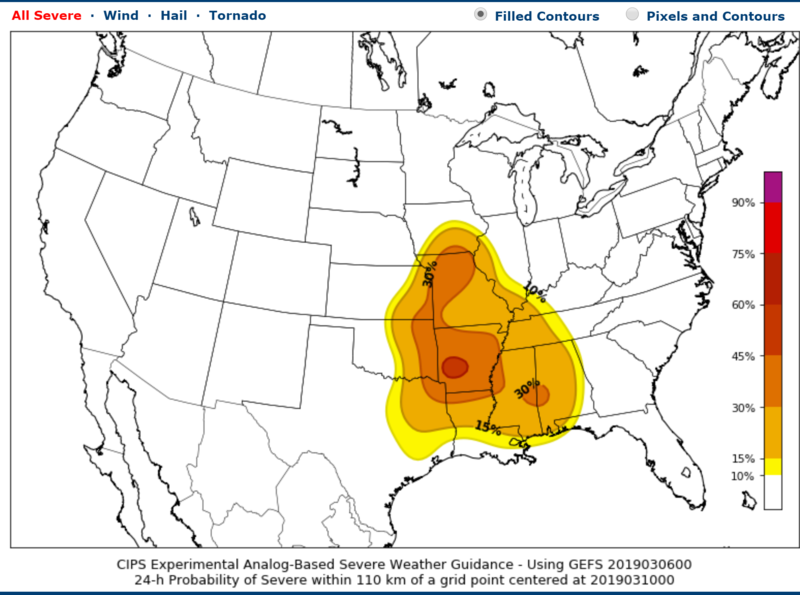 12z CIPS analogs has an area that had at least 1 severe report in 73% of the analogs. Within that is an area that had at least 1 tornado in 43% of the analogs. Latest from WPC is interesting. They're saying a squall will be ongoing at 12z Sunday. GFS is still pretty weak with moisture. 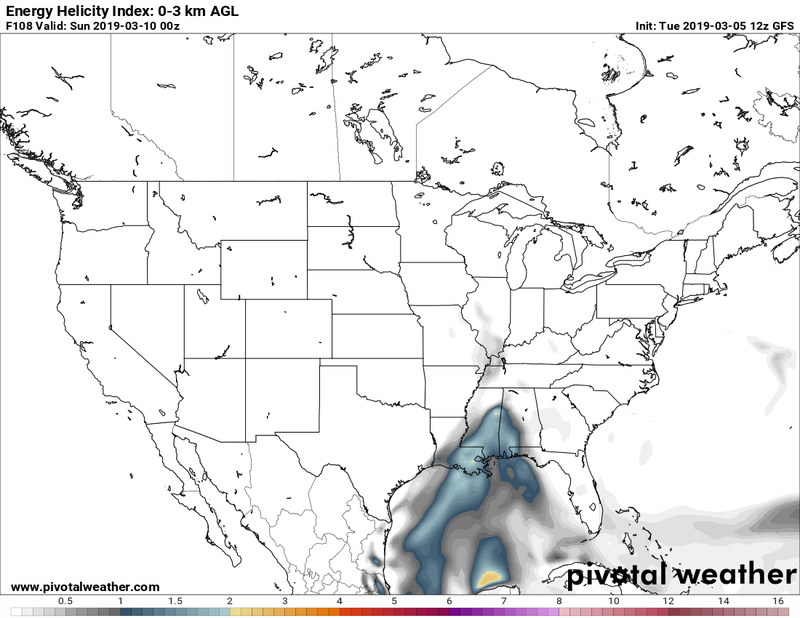 It does show a sufficient combination of instability and shear to hint at an overnight squall. Tornado potential in a case of a squall line is best found by looking at the low-level shear. In this case, low-level shear is greatest from 15z-00z, then weakens overnight due to the low occluding and the negative tilt/strongest winds removing itself from the cold front. Therefore, the highest severe threat with the overnight squall would be early, gradually tapering off throughout the night. GFS has the cold front stalling out just off the Gulf shore. This would set the stage for another system to take advantage of the reservoir of rich moisture created by this system. GFS 06z 500mb 850mb and Energy Helicity. This is really a massive area outlined for severe weather. Literally includes all of this subforum. Upper Midwest, and into the Upper Great Lakes Day 4 (Saturday 3-9). remains low during the second half of the period. deep-layer wind field warrants attention in future outlooks. risk area from the central Gulf Coast to the eastern Carolinas. WPC has a squall line lasting for more than 24 hours. 12z ramped up the event in spatial extent. Shear along the cold front in the south is rather underwhelming. Profiles are also pretty dry. I'm actually more impressed with the soundings up in the Midwest than in the south. 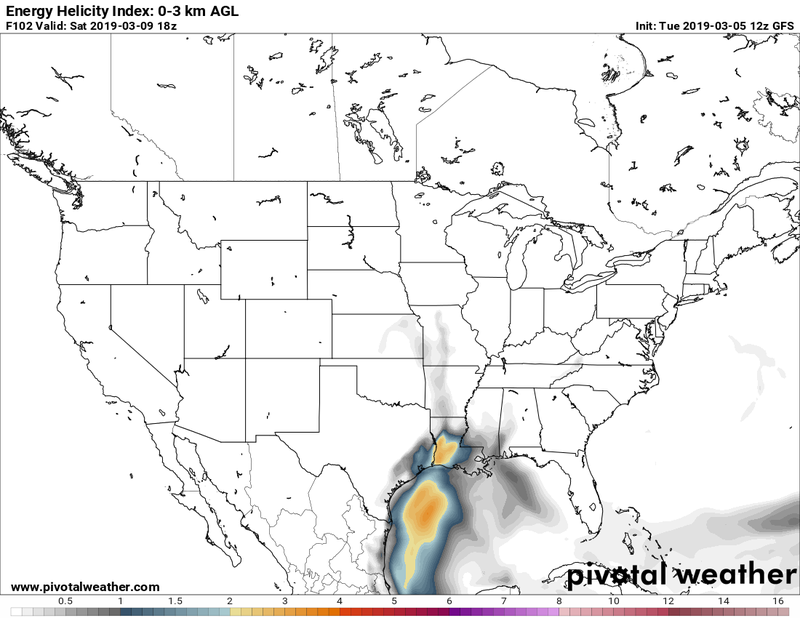 Instability is only 300-600 j/kg... about half of down south... but shear is much stronger. NAM, on the other hand... LOL. Okay buddy. Comparison of the 3 models' surface-based CAPE. Euro is the middle ground between the two, but probably leaning more toward NAM. Like usual. 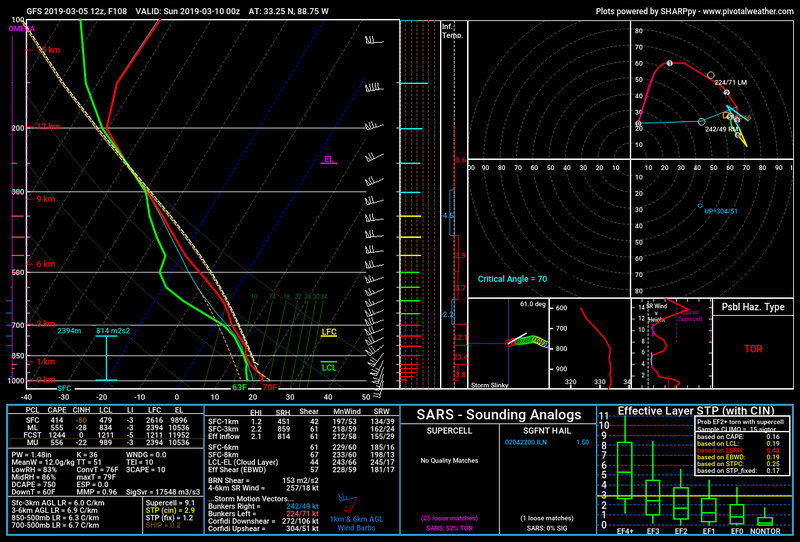 Well... if you're going to be wrong (looking at you, GFS and NAM) at least produce some fun soundings. Thanks NAM. GFS needs to learn a thing or two from you. the Mississippi Delta Region into the Tennessee Valley Sunday. largely unaffected by earlier storms. expected to possibly result in severe weather. to approach the area and will acquire a negative tilt on Saturday. been whether or not there would be enough instability. CAPE values over 1500 j/kg across much of the area. that are on my mind. The first question is...how far north with the warm front advance? the way north of the AR border. My second question is...how will the timing of this system evolve? a more favorable region for the development of rotating storms. 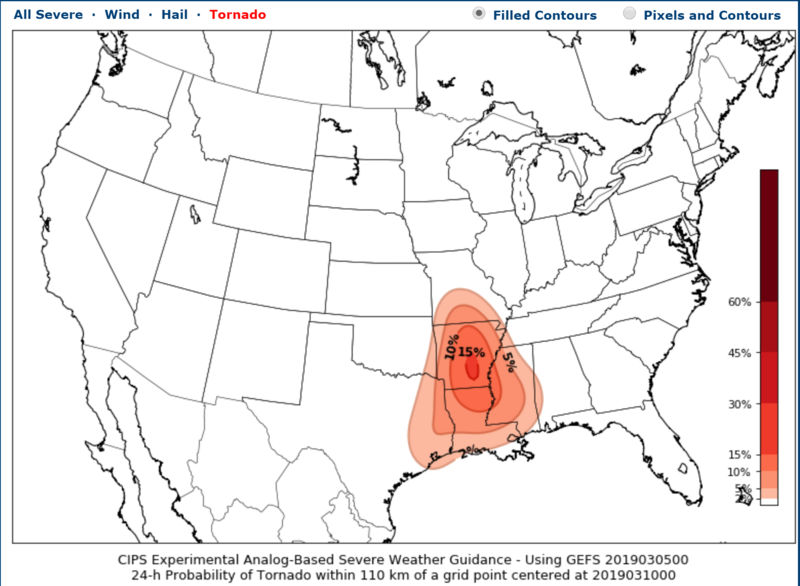 Not going to say I'm rooting for tornadoes, but this area is the zone that showed up in my analogs when I googled tornado outbreaks in March for the years I selected. 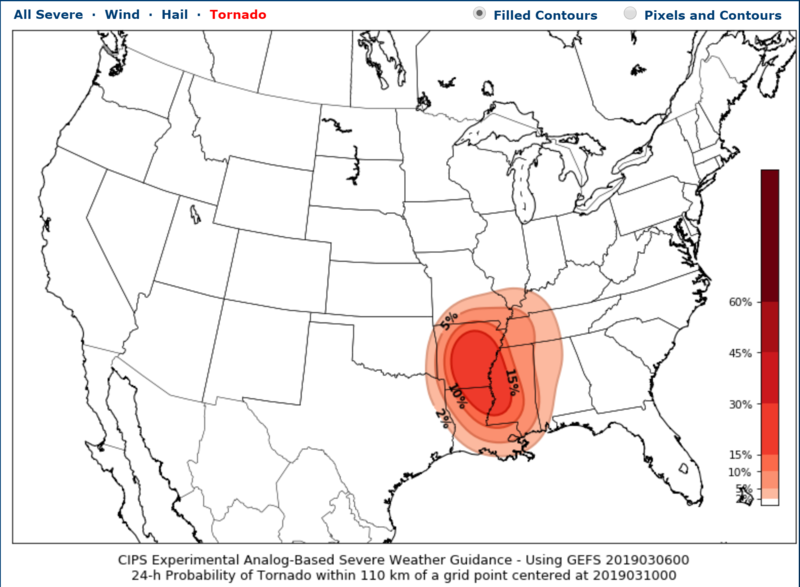 I think the outbreak next week will be worse for severe weather than this one overall, but we'll see. Ominous. It was already troubling but this is another bad sign. Yeah, lots of uncertainty with Saturday though regarding moisture and how far the warm front will actually go. But I agree about next week. Like I said in the spring thread, that setup reminds me of a multi-day severe outbreak sequence you'd see in May... except further south. My blend was 1942, 1958, 1970, 1975, 1999, 2005, 2010, 2015, with 1942, 1970, 1975, 2005, 2010 weighted twice, 1958 weighted three times. 1942, 1970, 2005 are all El Nino Springs - but they followed major hurricanes hitting the Gulf Coast, which for whatever always seems to precede incredible cold in the Western half of North America from mid-Feb to mid-Apr, usually March. The link actually shows March 2005 had over 100 tornadoes. Comparison of GFS, NAM, and HRRR for Saturday morning. GFS has much more warm sector precip and lower dew points, but a further north warm front. HRRR and NAM are very similar pretty much every way you cut it. They have the dry warm sector scenario covered which is the most ominous. HRRR's great resolution shows that the MCS has already formed by 12z... I'd guess that would travel east-northeast while some cells pop on its south side.